In this issue of JointHealth™ monthly, we are pleased to present a collection of facts and statistics that provide answers to many of the questions we often hear from people with arthritis, medical professionals and government. We also provide a report on ACE's recent trip to meet with elected officials in Ottawa. Arthritis is everywhere. In every city and town across the country, people live with arthritis. Some forms of the disease are serious, disabling and life-threatening; others are the result of a joint injury, overuse or advanced age. Think about the street where you live. If you walk down your street, someone in every third house lives with the pain and frustration of arthritis. People up and down your street, in your neighbourhood—the man at the coffee shop, the woman who works at the corner store, your next door neighbour, your child's classmate—one in six of these people lives with arthritis. Yet, in spite of the fact that arthritis is incredibly common, ACE hears time and time again that people with the disease feel as though they are living alone with a disease they do not know enough about. In feedback from ACE community members and JointHealth™ subscribers, people with arthritis overwhelmingly report a desire to know more about the disease: what it is, who has it, how arthritis treatment stacks up next to treatment for other diseases, and how much arthritis costs our society, our economy, our families, and ourselves. In this issue, ACE provides answers to many of those questions. Inside, you will find a collection of facts and statistics that provide answers to many of the questions we hear from people with arthritis, medical professionals and government. We hope you find it helpful. More than four and a half million people live with all types of arthritis in Canada. 1 out of 6 Canadians has arthritis. 60% of Canadians with arthritis are between 15 and 60 years of age. Arthritis affects people of all ages, from babies to senior citizens. Arthritis affects people of both genders and all races. Arthritis is among the three most common chronic diseases in Canada. Arthritis is among the most common chronic diseases in children. One in 1,000 children in Canada has arthritis. Osteoarthritis—is caused by a breakdown of cartilage in joints causing bones to rub together resulting in pain, stiffness and eventual loss of use. There are some forms of osteoarthritis that appear to be genetically driven, and others that are a result of injury, overuse or advanced age. Inflammatory arthritis—is a general term used to describe autoimmune forms of the disease. In inflammatory arthritis, the body's own immune system attacks healthy joints and tissues, causing inflammation and joint damage. Rheumatoid arthritis is the most common form of inflammatory arthritis. Other forms include ankylosing spondylitis, psoriatic arthritis, lupus and many others. More than 600,000 Canadians live with inflammatory arthritis. Diseases like juvenile idiopathic arthritis and juvenile dermatomyocitis affect only children, while diseases like ankylosing spondylitis tend to strike people in the prime of life. Arthritis and related conditions can lead to death. Two people per 100,000 die from arthritis, and a significant number more die from co-morbidities like heart attack/stroke, lymphomas and certain other types of cancer as a direct result of having arthritis. We do not have an accurate count of people who die as a result of their arthritis. This is because the immediate cause of death is what is recorded, and not co-morbidities. In other words, a person can have rheumatoid arthritis for 15 years, and then develop lymphoma as a result of their arthritis. If that person were to die of lymphoma, the cause of death would be recorded as cancer, not arthritis. Arthritis affects more adults than cancer, heart disease, respiratory conditions and spinal cord trauma, and has a serious impact on quality of life. 19% of Aboriginal people living off-reserve report having arthritis (data are only currently available for people living off-reserve). If the Aboriginal population had the same age composition as the overall Canadian population, this rate would be 27%. While there is no known cure for arthritis, excellent treatments exist for many forms of inflammatory arthritis. Biologic response modifiers, used in combination with other medications, are the current "gold standard" in treatment for many types of inflammatory arthritis. Unfortunately, these medications are expensive enough that many Canadians cannot afford them, and coverage on provincial formularies varies widely across the country. For all age groups, arthritis disables two to three times more workers than all other chronic conditions. The cost of musculoskeletal diseases in Canada is estimated at $16.4 billion each year, the second highest cost after heart disease. Long-term disability accounts for almost 80% of the economic cost of arthritis. People aged 35-64 incurred 70% of these costs. In rheumatoid arthritis, reported rates of work disability are remarkably high: 32% - 50% ten years after onset and 50% - 90% thirty years after onset. Studies have also shown that work disability occurs early in the course of rheumatoid arthritis. Treating people with rheumatoid arthritis with biologic response modifiers helps them stay at, or return to, work—but biologic response modifiers are out of financial reach for many Canadians. Disability associated with arthritis costs the Canadian economy about $4.4 billion/year. Research funded by the Canadian Institutes of Health Research, led by Dr. Monique Gignac of the University of Toronto, found that the average economic cost of arthritis disability is $11,500 per person per year. People with severe, uncontrolled arthritis face significant physical limitations and have difficulty preparing their own meals, dressing themselves and even managing their own personal hygiene. Due to the emotional, psychological and physical impact of the disease, the rate of divorce in couples where one spouse has rheumatoid arthritis is significantly higher than in those couples without the disease. Inflammatory arthritis causes people to give up careers they love, to lose their jobs or to simply stop working. Parents who live with inflammatory arthritis often face significant physical challenges in caring for their children. People with arthritis often lose the ability to participate in the things they love to do; sports, travel and socializing are often severely curtailed. Across Canada, access to reimbursement for medications varies widely; medications which are reimbursed in some provinces are not covered in others. In real terms, this means that some people in Canada are receiving the "gold standard" in treatment, while others are not. This is an issue affecting people who do not have the financial resources to pay for these medications—the elderly, people with low incomes and individuals and families who are not covered by private insurance. Inequities in care also exist between people with different disease-types; for example, people with ankylosing spondylitis have, on the whole, coverage for significantly fewer medications across the country than people who live with rheumatoid arthritis. First Nations and Inuit people covered under the federal Non-Insured Heath Benefit (NIHB) have some of the worst access to medications in the country. Aboriginal people dependent on the NIHB drug reimbursement plan who live with psoriatic arthritis and ankylosing spondylitis have no coverage at all for biologic response modifiers. People living with the same diseases in some other provinces, including Ontario and Quebec, have coverage for at least some biologic response modifiers. In 2005, the Canadian Institutes of Health Research funding for HIV/AIDS research was $42.4 million. In 2005-2006, the Canadian Institutes of Health Research spent $118 million on cancer. Canadian Institutes of Health Research, through its Institute of Musculoskeletal Health and Arthritis, spent $3.7 million on arthritis and bone research. These numbers equate to a research investment of $731 for every person living with HIV in Canada; $14.16 for every person living with cancer; $4.98 for every person living with diabetes; $0.93 for every person living with arthritis. 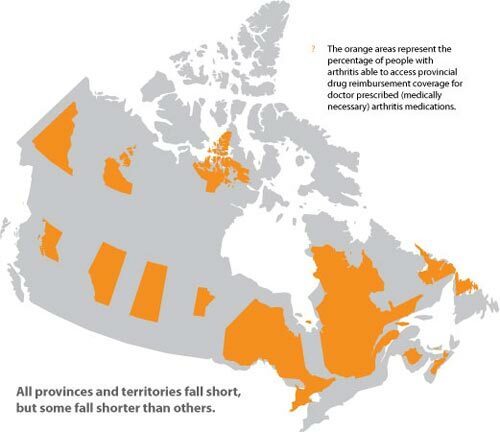 In provinces like Alberta, Manitoba, Prince Edward Island and British Columbia, people living with arthritis are receiving poorer care than many other Canadians due to very restrictive reimbursement coverage for medications. Aboriginal people covered under the Non-Insured Health Benefit (NIHB) who have rheumatoid arthritis have their coverage for biologics triaged, meaning that they have been prioritized in a way that is not based on scientific evidence. People living in the Northwest Territories and Nunavut, who do not have private health insurance, have coverage only for those drugs listed on the federal Non-Insured Health Benefit (NIHB) formulary. There is an arthritis crisis in Canada. More than 4.5 million Canadians live with the disease—babies, teenagers, people in the prime of working life, senior citizens—yet, the emergency has not yet been fully acknowledged. For these reasons and many others, ACE went to Ottawa in January as part of the Alliance for the Canadian Arthritis Program (ACAP) to meet with elected officials and raise awareness about the disease. The response has been very encouraging. Representatives from ACE met with MPs and policy advisors and heard some very positive responses. As part of the ACAP, we are moving towards the goal of creating a country where people with arthritis are no longer treated like second-class citizens by the health care system, and we are thrilled to have found so much support from decision-makers in Ottawa. To keep the momentum going, we encourage people with arthritis across the country to write to their MPs and provincial elected officials and tell them that you look forward to seeing support for a comprehensive Canadian arthritis program, one that offers excellent standardized education, treatment and care from coast-to-coast. Tell them that you would like to see the three priority standards identified by the Alliance for the Canadian Arthritis Program (ACAP) made a reality as soon as possible. Tell them that you believe that it is time for people with arthritis to enjoy the same excellent treatment that people with diseases like cancer and HIV have access to. Tell them that you want to remain a productive member of society, contributing to your country, community and family. Tell them that your life has value. Thank you for speaking out for Canadians with arthritis.